The paved gated roads leading right to the front steps are ideal for motorcycles. 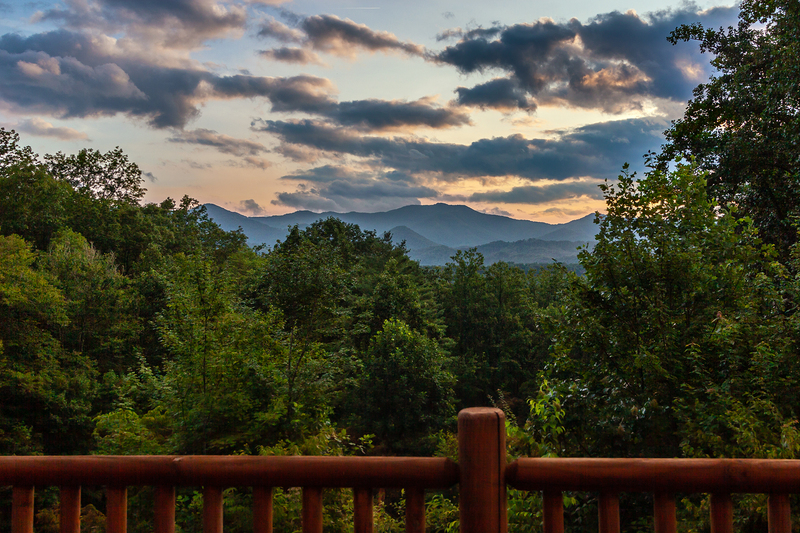 Watch a NC Mountain Sunset from the porch of this rental cabin. 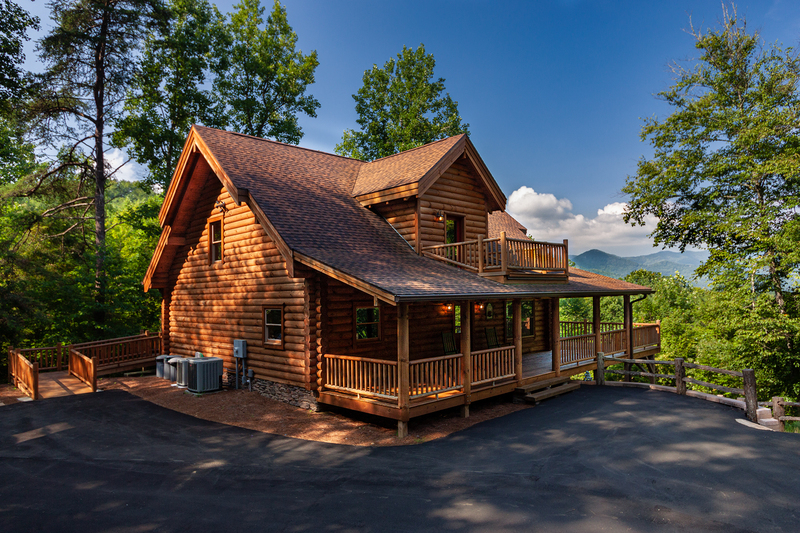 This two story NC log cabin rental is tucked in a secluded wooded corner of the smoky mountains. 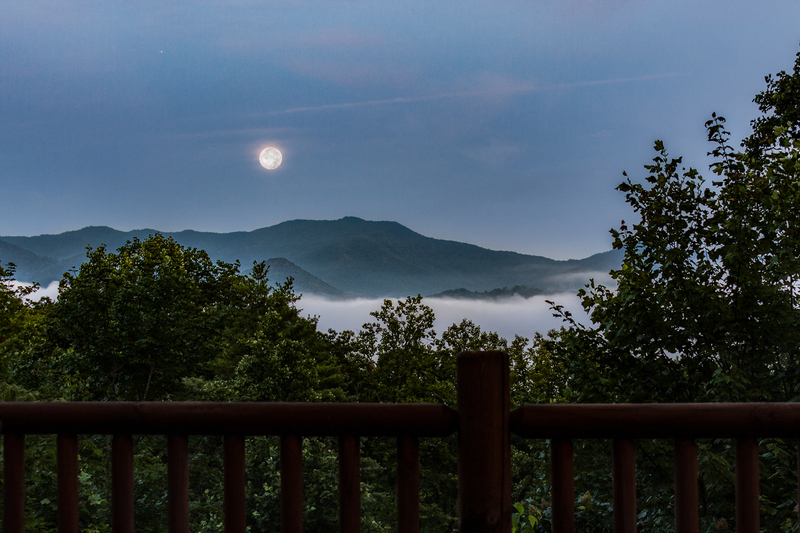 Watch the moon fall behind the mountains as a peaceful romantic North Carolina night ends in a beautiful mountain sunrise. 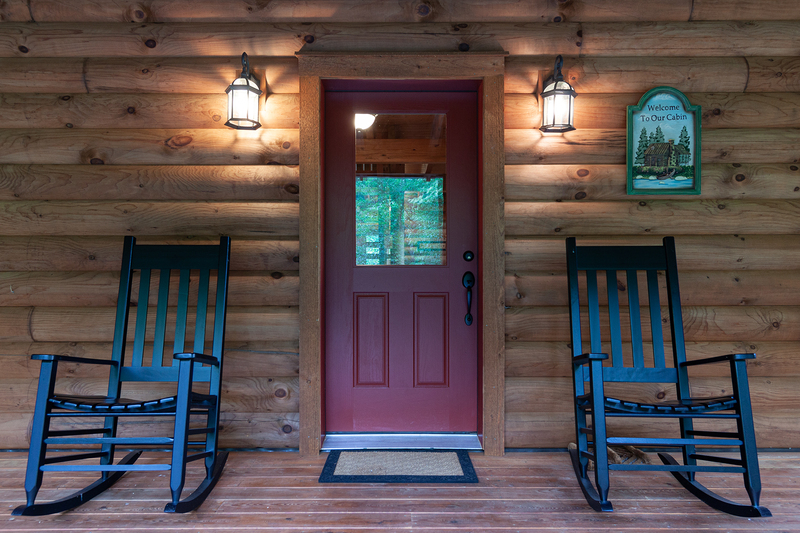 Your doorway to a Secluded Peaceful Mountain Paradise vacation getaway. The motorcycle friendly roads to the cabin. 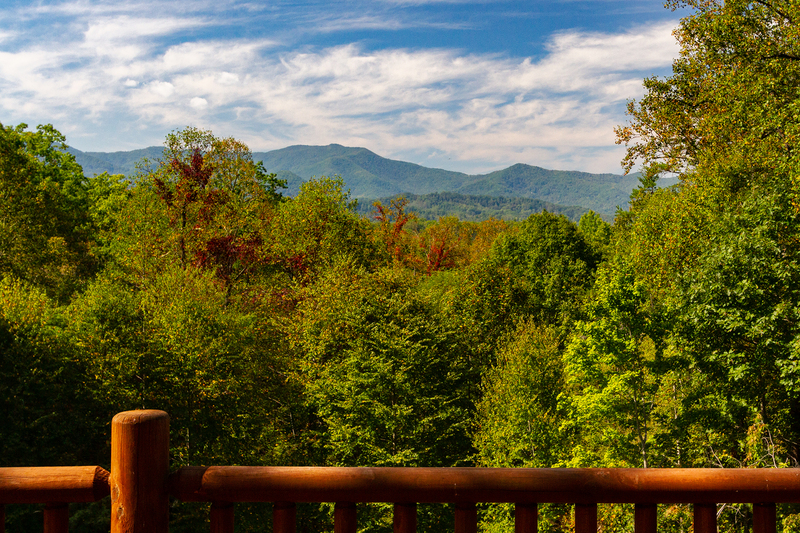 View of the smoky mountains from the deck. 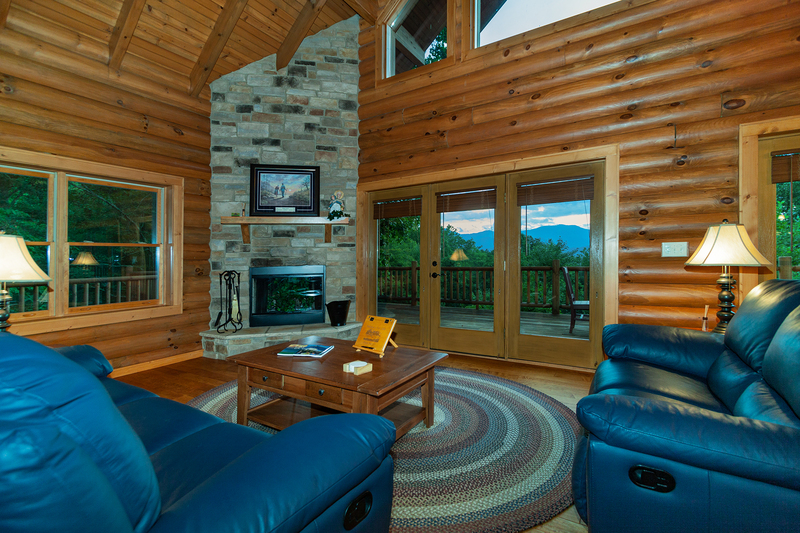 The living room has the classic log cabin warmth of a wood burning stone fireplace and a window wall of mountain view. 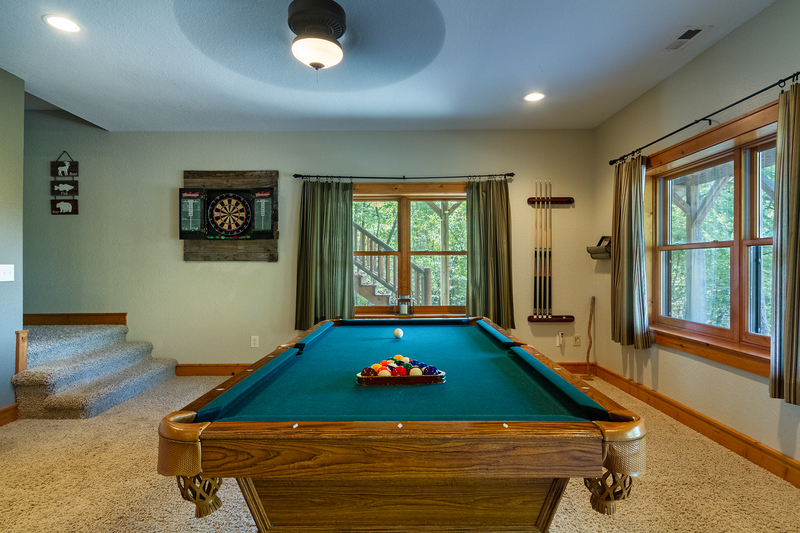 Play a game of pool with a mountain and large screen TV views..
Rainy days turn in to movie day or game day in the theater section of the lower level entertainment room. The elegant kitchen rivals any seen in a magazine. 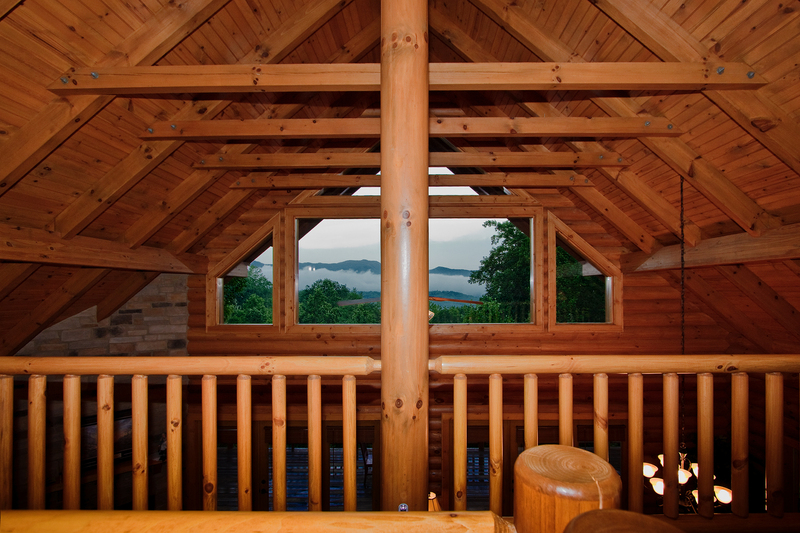 View of the mountains from the loft . 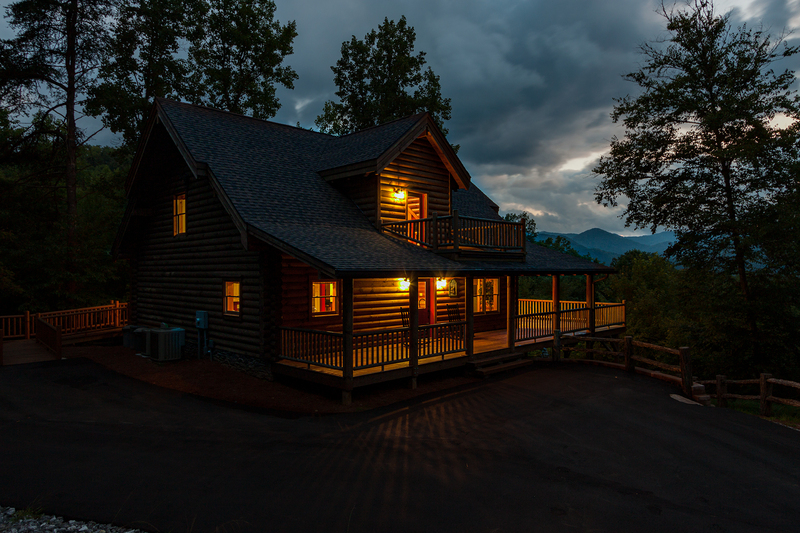 Secluded in The Great Smoky Mountains this cabin is located about 15 minutes from Bryson City and Cherokee. Scenic drives take you to many nearby attractions. Shopping in the area is a fun way to find many local treasures. 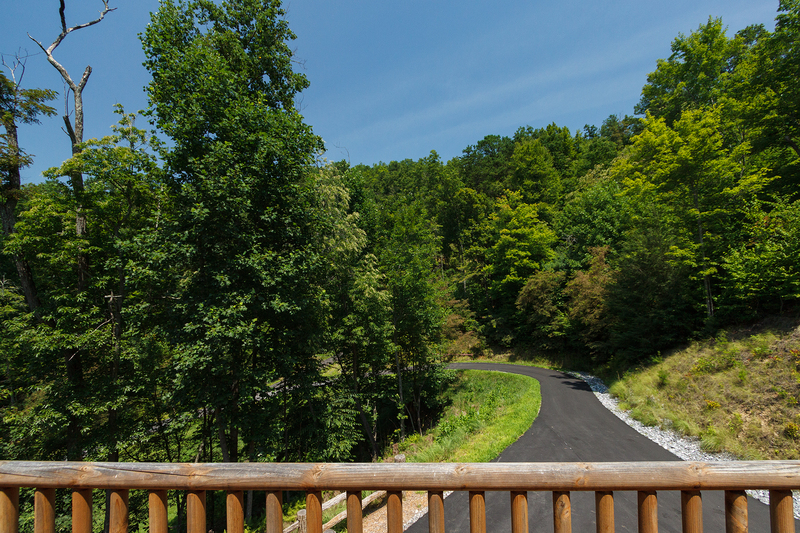 Fill your days here with relaxing hikes to the waterfalls on Deep Creek, picnics and tubing. 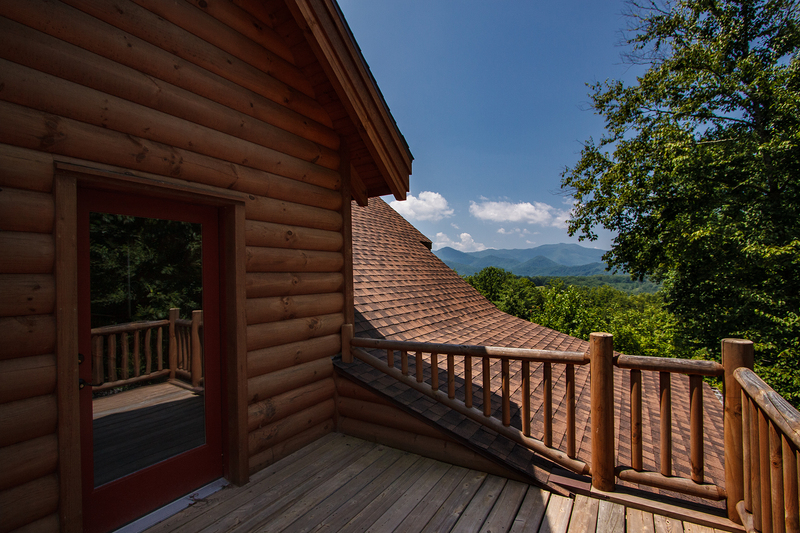 Horseback riding, whitewater rafting down the Nantahala River, drives through the National Parks, gaming at Harrah's Cherokee Casino, or a round of golf at the Smoky Mountain Country Club. 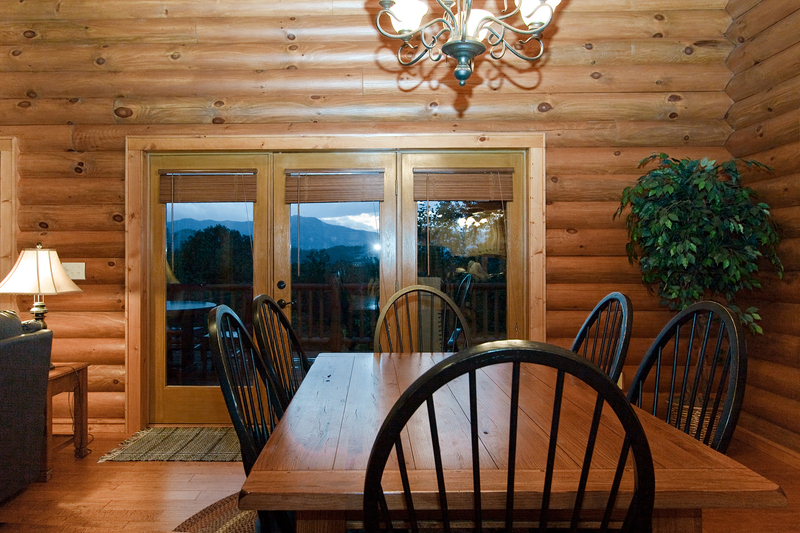 This beautiful log cabin home sits privately on a mountain side in a gated community. Paved all the way to the front steps. 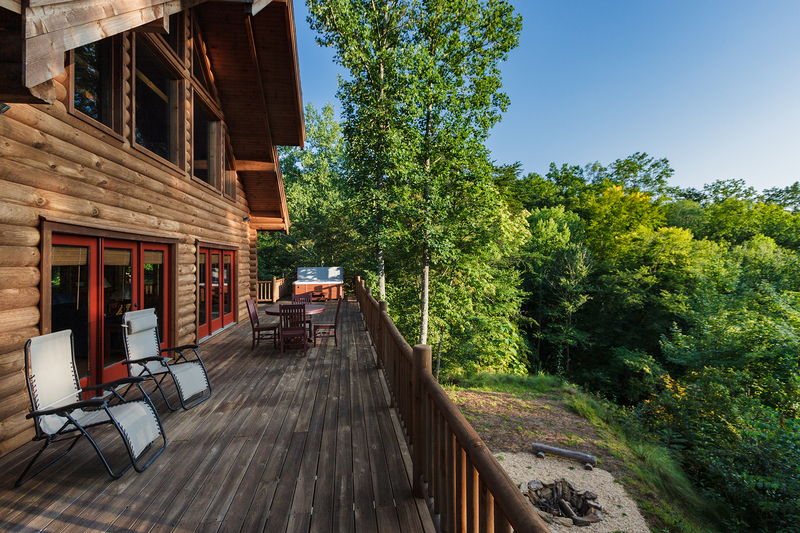 This cabin features covered porches and decks on all levels. The outdoor living space keeps you in touch with nature. Amazing long range views and the forested environment captivate you and feel your soul with peace. 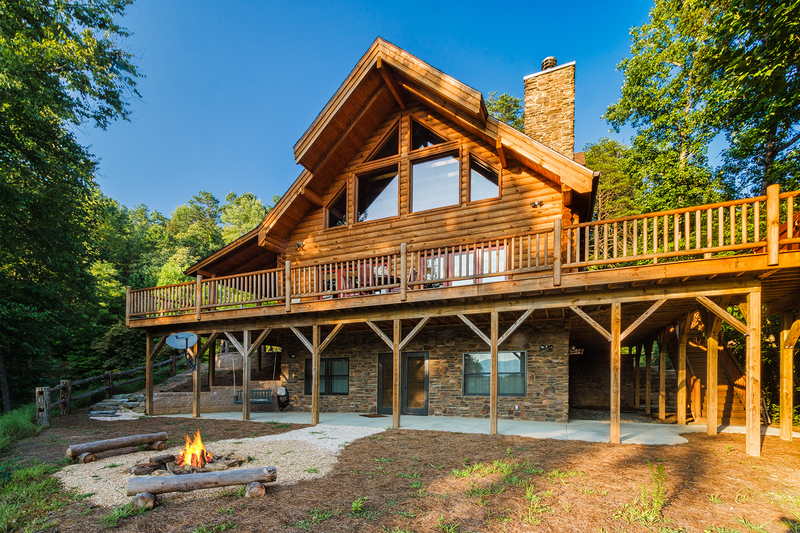 A gas grill is located on the left side of the cabin, grilling up your meals in this beautiful place will make your food taste even better! Lots of seating along the deck makes taking in the views and quietness a treat. There is place to dine outdoors or enjoy a cup of coffee in the morning while the sun rises. 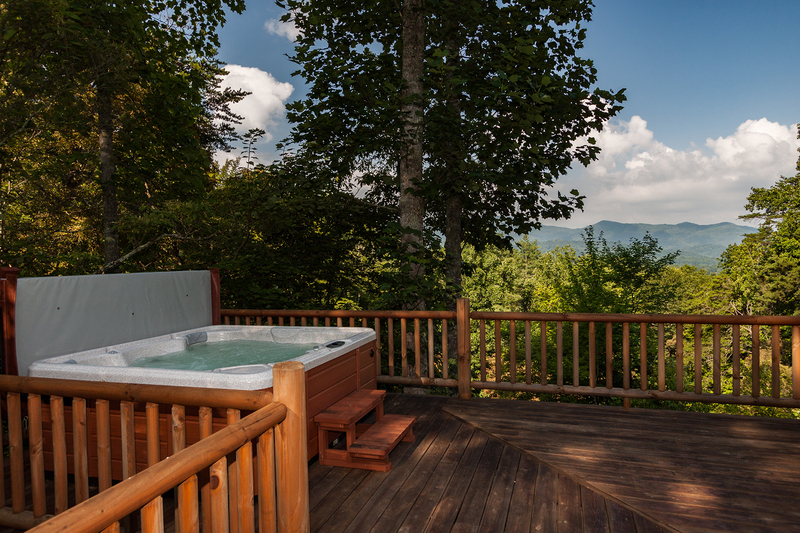 On the left side of the deck a large six person hot tub awaits for you to sink into under the stars at night. 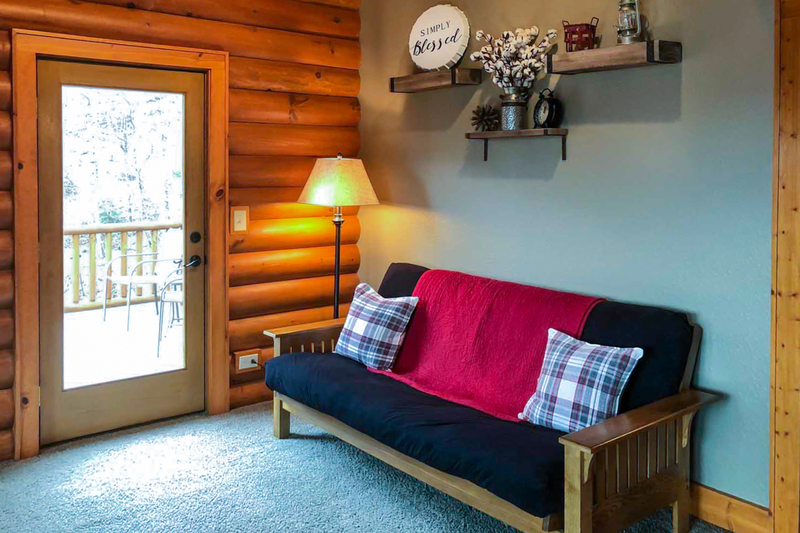 Warm bubbly water and great company make this a favorite feature of this cabin. There is a set of stairs that take you down to the lower patio. Make this your next stop of the evening after a dip in the hot tub. 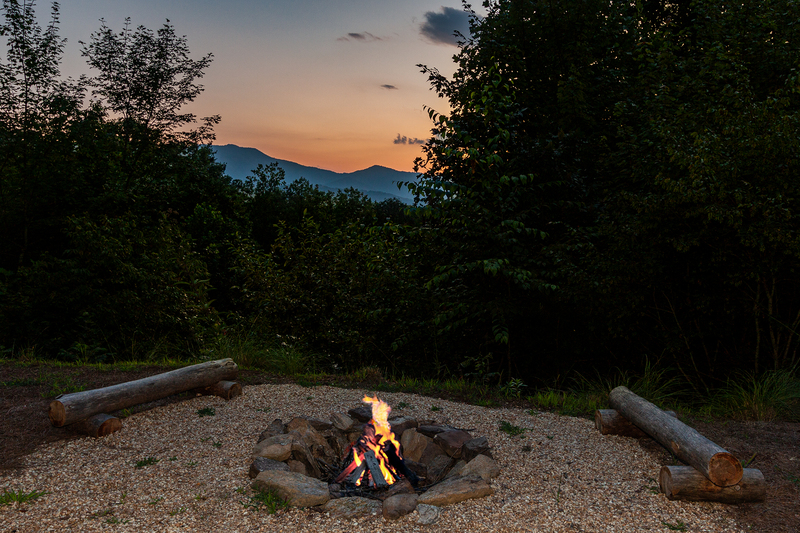 A large fire pit area is designed to keep you warm while watching the moon rise over the mountains in your view. Handcrafted log benches give you a place to sit while roasting your marshmallow to a perfect golden brown. 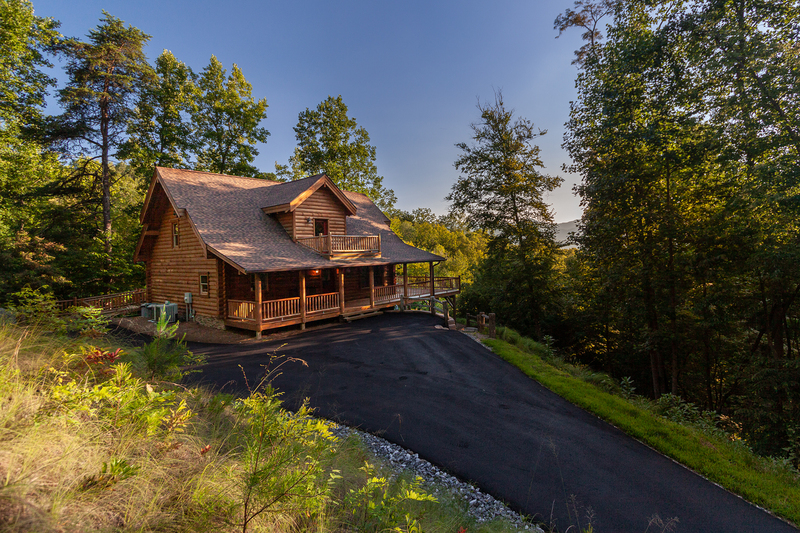 During the day you can enjoy the paths that take you through the wooded areas around this cabin and get your fill of the fresh mountain air. 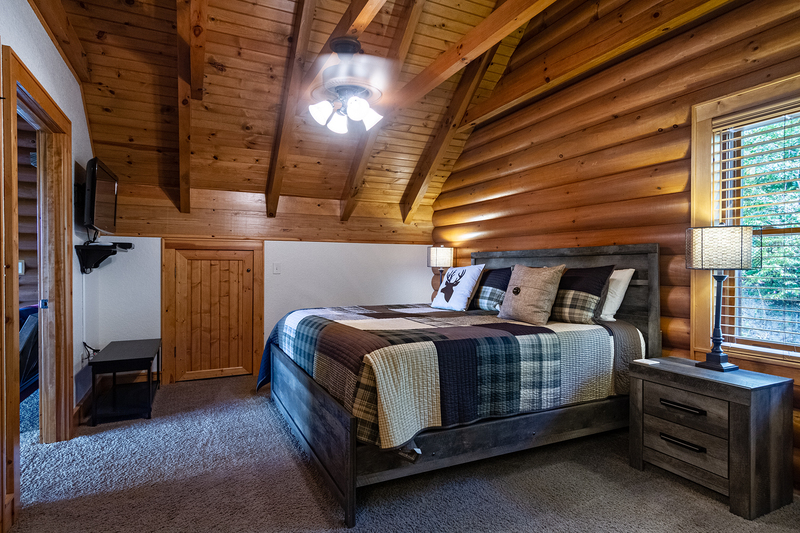 This luxury log home welcomes you inside with rich wood tones, large chalet windows, vaulted ceilings, custom hard wood floors, and elegant touches. The main floor has an open floor plan and creates a great space for entertaining. A large dining table takes in the outdoor views through large windows than span through the entire living area. Soft blue leather sofas look out to the mountains as well as to the grand stone wood burning fireplace. Snuggled up and watching a hot fire glow on cold days makes you feel so relaxed. 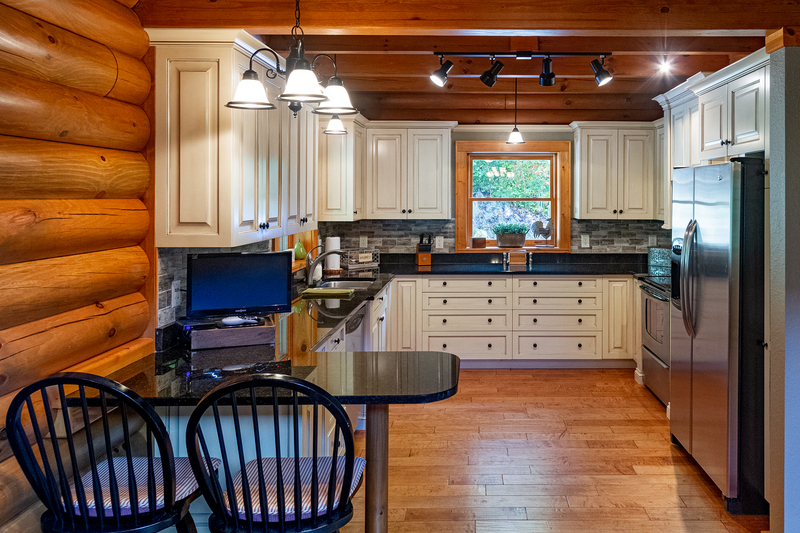 The great room also has a fully equipped and very elegant kitchen. Beautiful cabinetry, black granite counter tops, and stainless appliances. A very warm inviting space to prepare meals together. Off from the kitchen is a full bath with shower, and the second bedroom. This room has a comfortable queen size bed. The wooded view brightens this space and a door leads you out to the deck, perfect for a romantic late night dip in the hot tub. From the great room and stairway leads down to the lower level and a stairway leads up to the upper level as well. 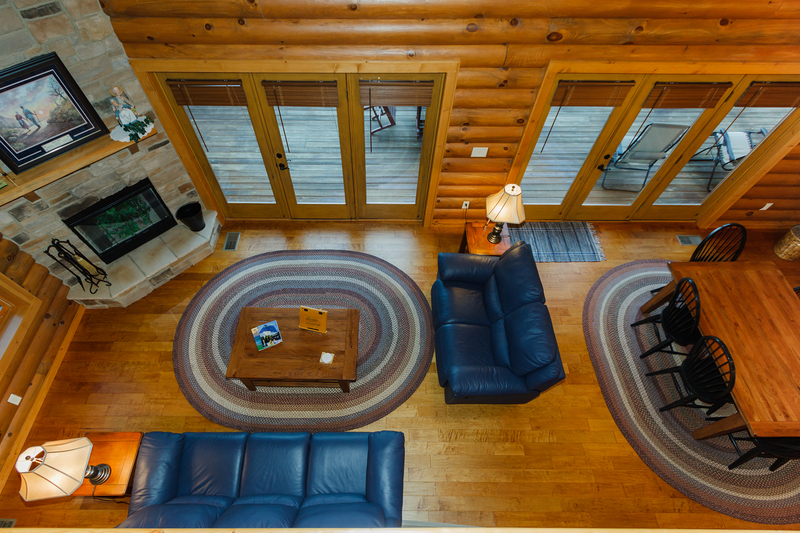 The top floor has soft plush carpet and leads you from an open loft into a suite that can be closed off for privacy. 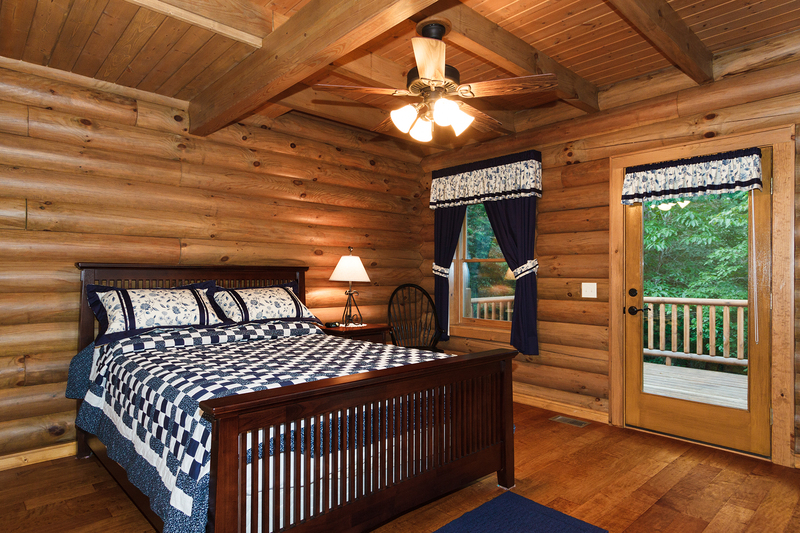 This suite has a king size bed and is a very restful, romantic space. There is a full size bath with shower open in this room. A very comfortable retreat for any couple. The loft area has a futon for additional sleeping space, and a private balcony for taking in the refreshing cool breezes. 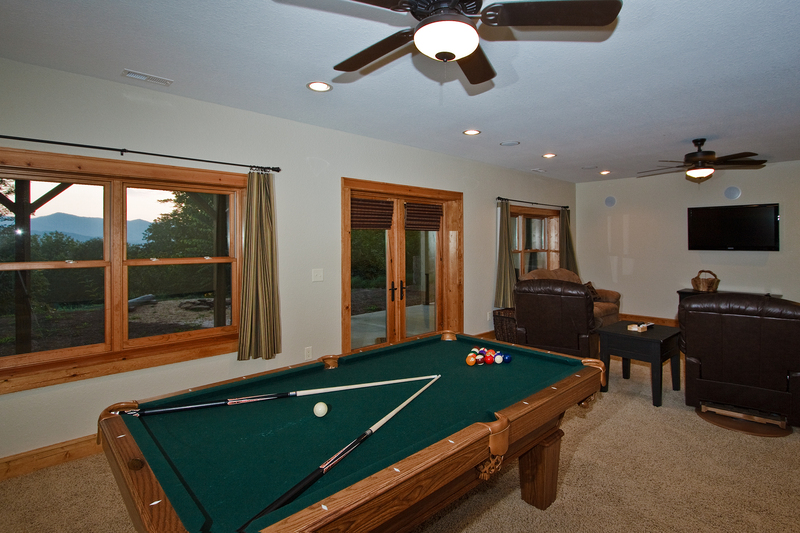 The lower level has an additional living space and game room. 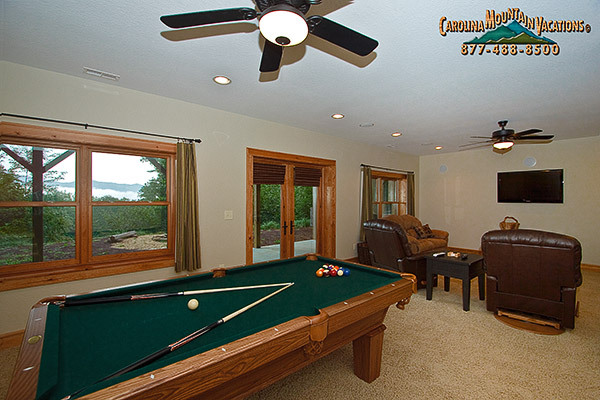 A pool table is set for a friendly game and board games and puzzles provide entertainment for the little ones. Great views from the outdoors fill this space too. 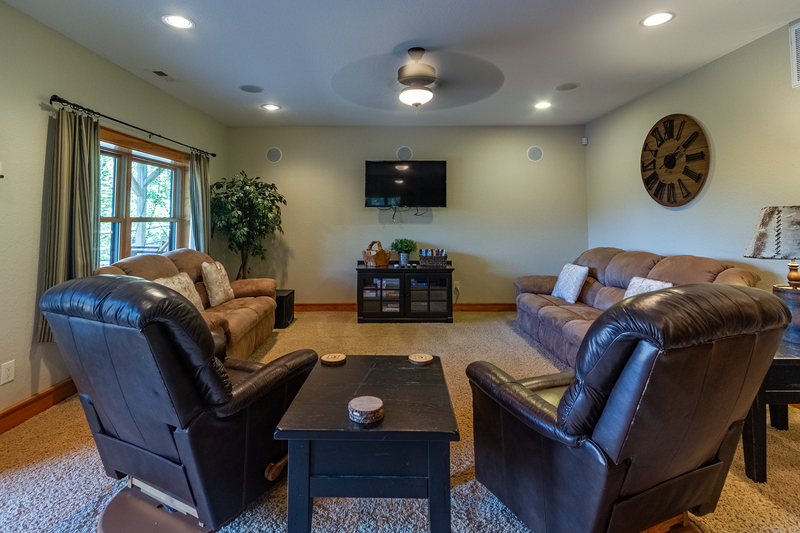 Duel recliners and sofas surround a satellite TV and DVD with awesome surround sound, making movie night a highlight to any evening. Down a short hall is the third bedroom. 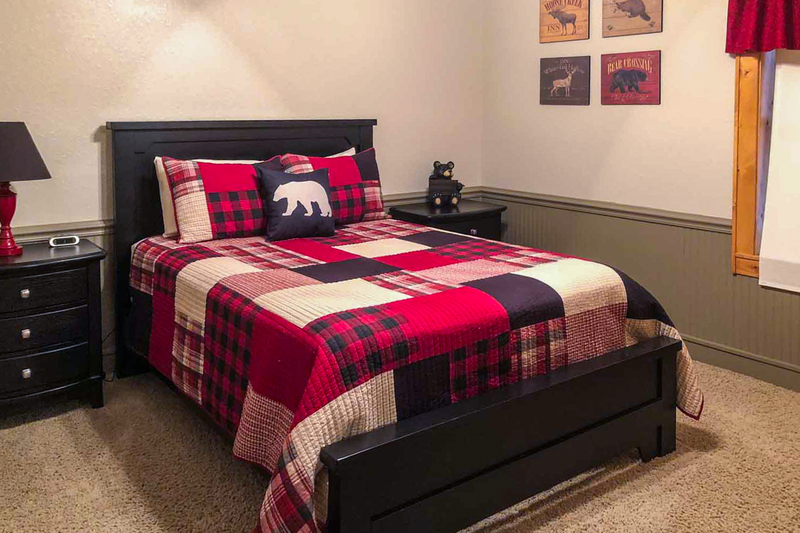 A queen size bed makes this quiet space a nice retreat to rest for the next day. Next to a full bath with tub and large laundry room with washer and dryer.